Dental treatment goes smoothly when your child can relax and cooperate. At Great Beginnings, we have many tricks up our sleeves to make it easier for kids to do both! during their dental experience. With this technique, dental team members first tell the patient what is going to be done with appropriate terminology. Next, they demonstrate the procedure to the child on a model. For example, they might show the child on their finger. Finally, they do the procedure, completing the work in the child’s mouth. Dr. Laura and Dr. Rachel went through specialty training and education to administer Nitrous Oxide. Nitrous Oxide is a mild gas, mixed with oxygen, used to help create a positive dental experience. It helps our patients relax during their dental visit, reduces their anxiety and fear, and helps make a somewhat longer dental appointment feel easy and quick! There are limited to no side effects, and at the end of the appointment, your child is back to themselves and ready for school! 3. All Team Members Use Clear, Age-Appropriate Vocabulary. The team at Great Beginnings Pediatric Dentistry can take a lot of fear and confusion out of your child’s visit simply by choosing their words wisely! Instead of a cavity, it’s a “dirty spot.” Similarly, the nitrous oxide mask is a “happy nose,” x-rays are “pictures,” and a dental scaler is a “tooth counter.” These non-threating words allow your child to understand what we’re doing without scaring them in the process. 4. Our Team Does All the Talking. If too many people talk at once, most of us feel overwhelmed. Moreover, if different people say different things, children can quickly get confused. 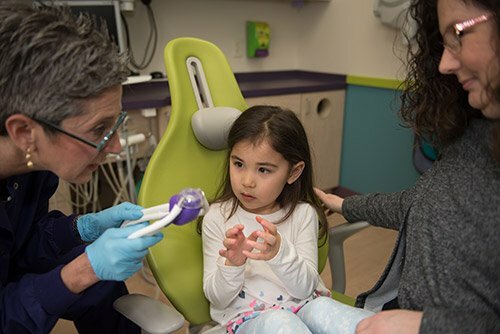 At Great Beginnings Pediatric Dentistry, we ask caregivers to allow our dental team members to do all the talking to your child in order to avoid these issues. Caregivers can comfort and support their children by holding their hands and reassuring them that they are close by. 5. We Emphasize the Positive. No matter what struggles a child may face during a dental visit, our dentists and team members emphasize the positive with your child. We point out their successes and encourage them along the way. In short, we support your child emotionally while attending to their oral health needs. We want your child to love visiting the dentist! That’s why at our specialized pediatric dental office, we’ve designed our entire practice around a child’s comfort and needs. From the artwork to our open hygiene bay area, every aspect of our office works to help reduce your child’s dental anxiety and make a visit to the dentist fun!